Our trip to France was sweet. I’m not talking about the food, which, of course, was amazing. 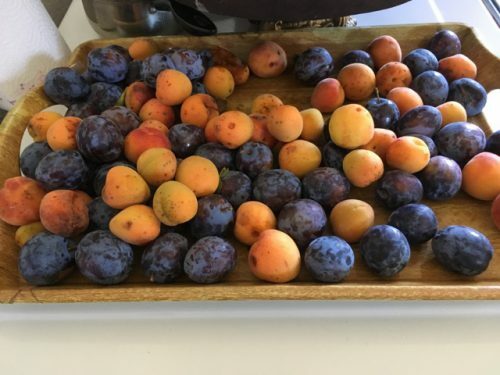 My food pictures leave something to be desired — not the food, my pictures. 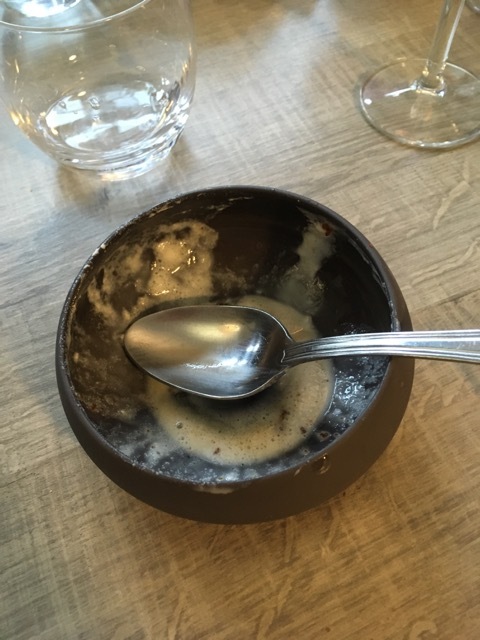 Like this dessert — I don’t remember what it was, but it was delicious. 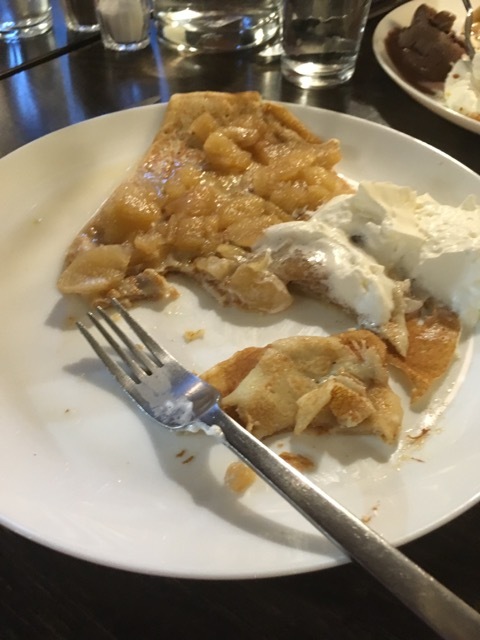 Or these crepes — which looked so wonderful that I started to eat them and then remembered to take a picture. 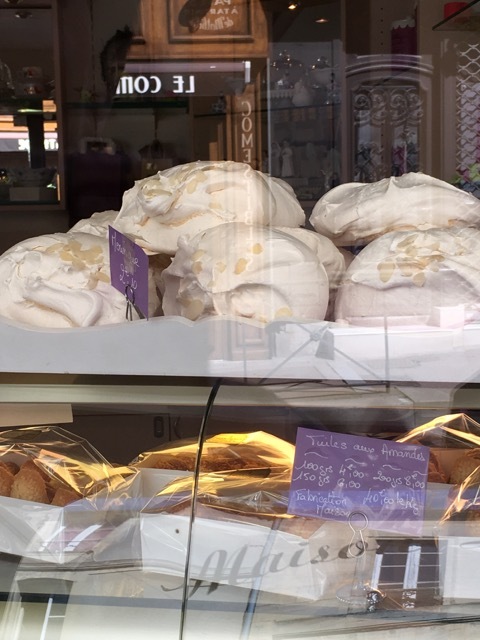 I took a picture of these meringues on Day 1 because I had never seen such large meringues. The patisserie was closed but I wanted to remember to buy some later. Unfortunately I forgot. 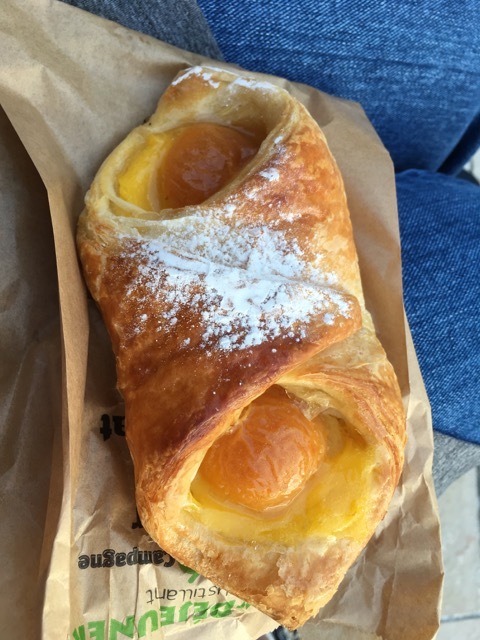 This pastry with apricots was really good but I can’t remember the name. 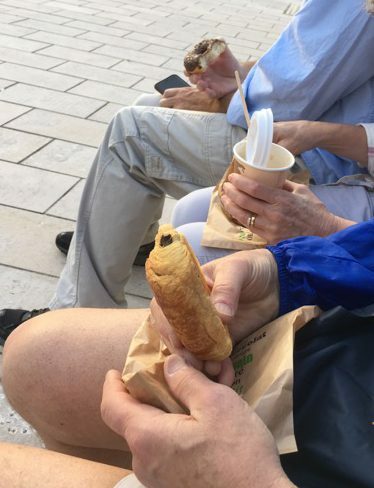 The sweetest thing about that pastry, though, was that my siblings and I sat outside on a bench to enjoy our selections from the patisserie together. We talked and enjoyed the morning sun before heading back to our hotel. For years, I had heard my father say that he really wanted to see the beaches of Normandy — so we made it happen. He probably doesn’t remember the trip today — at least not without the aid of the photo book we put together. For one week last May, we fulfilled one of my father’s dreams — and had a good time doing it. In preparation, I had focused on the tired parts of the day: the getting up before 4 AM and the getting home after 1 AM. I was worried about the city, all those people crowded together and the tall buildings holding them in, a barricade between city and country, urban and rural, not home and my home — and I was spending a day on the wrong side of the barricade. 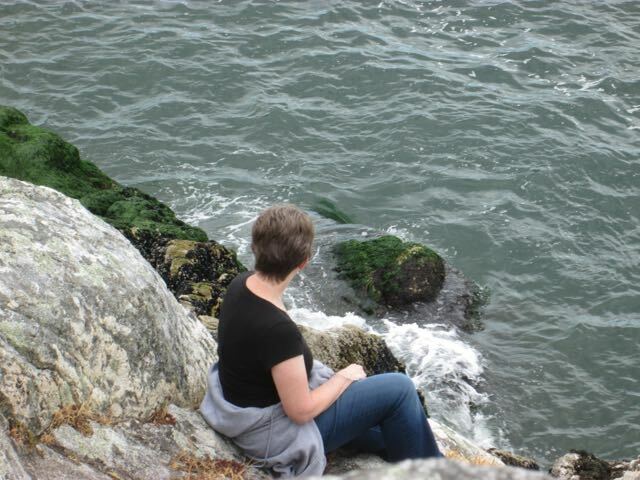 I braced myself against the day instead of leaning into it. I felt like you, who had never been to the city before, should be going with someone who loves the city and that’s not me — but you wanted me to go so I figured I’d better make a good effort. “What do you want to do?” I had asked you. We had several hours to kill on either side of Dear Evan Hansen. “I dunno,” you replied, in that helpful way you have. 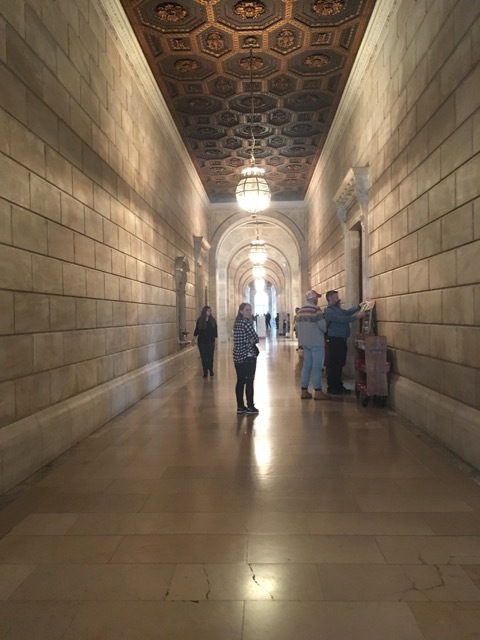 So I worried about that, too, and finally decided we should go to the New York Public Library. You love books. I knew that if it turned out to be just a bunch of books you would be thrilled. 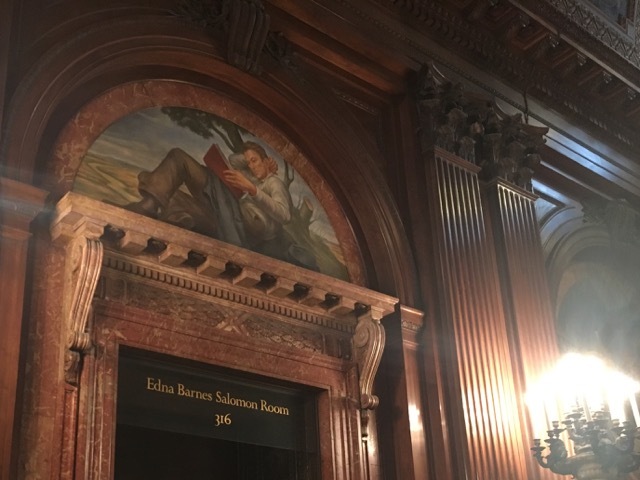 You would pull the oldest book you could find off the shelves so you could hold it in your hands, feel the paper, and smell the old book smell. I’ve seen you do that. The library was the right choice. 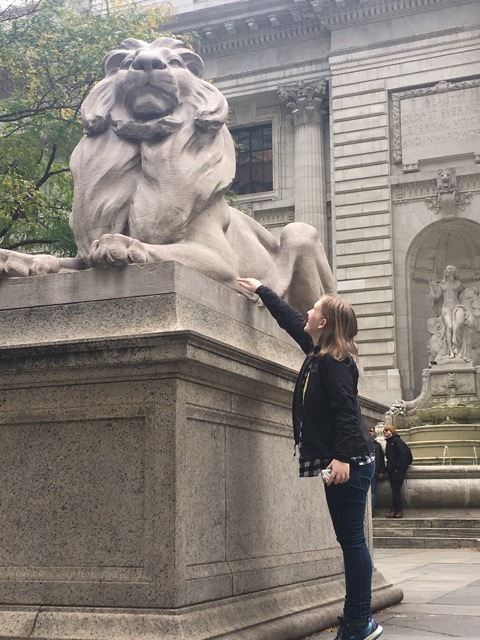 You reached up to touch one of the stone lions that guarded the main entrance. 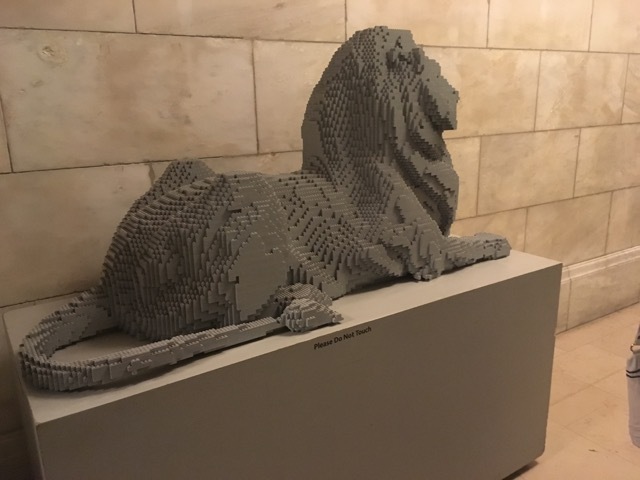 Inside, I touched the Lego lion that guarded the entrance to the children’s room. But what a magnificent place! You wished you could climb up the ladder to the second tier of books that ran the circumference of the study room. I wished I could have seen the original card catalog where now tables of computers sit, the card catalog’s modern replacement. 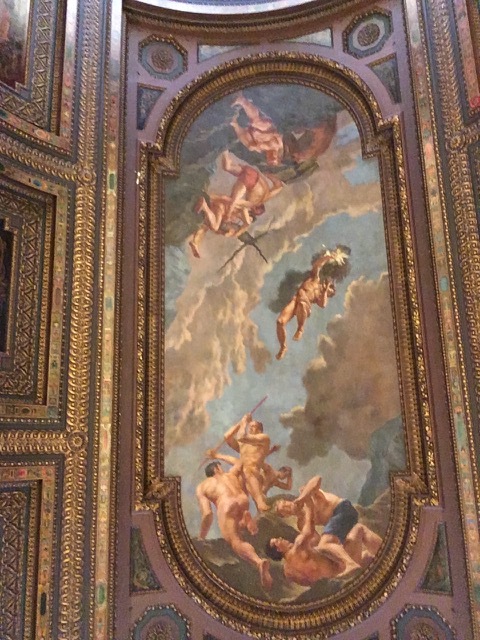 We walked the long hallways, climbed the marble stairs and admired the art work that was everywhere. As we were leaving, we noticed a sign for tours of the library. Our 2 hour visit served as a peek — there’s so much more, I’m sure. Next time we’ll have to take the tour. Did I just say next time? Next time? After spending some time there, I kind of want to go back. We should do that, don’t you think? 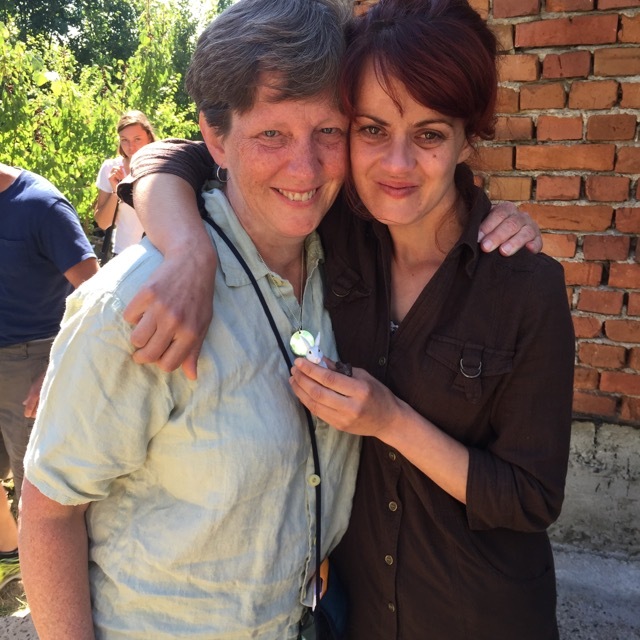 Our work in Bosnia took place in Gradacac, a city about 3 hours north of Sarajevo. 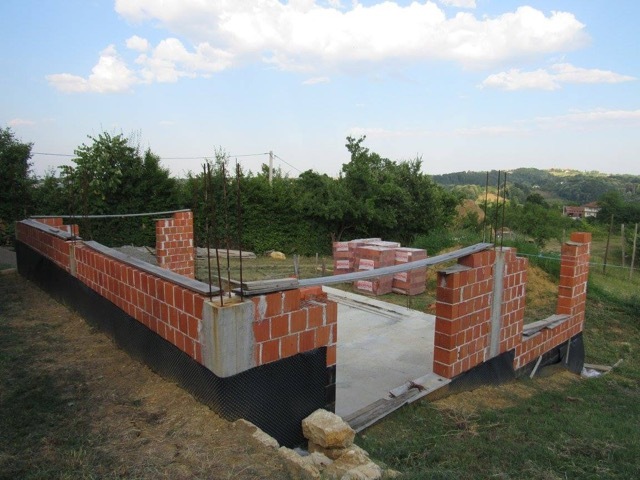 Ostensibly, we were there to build a house. 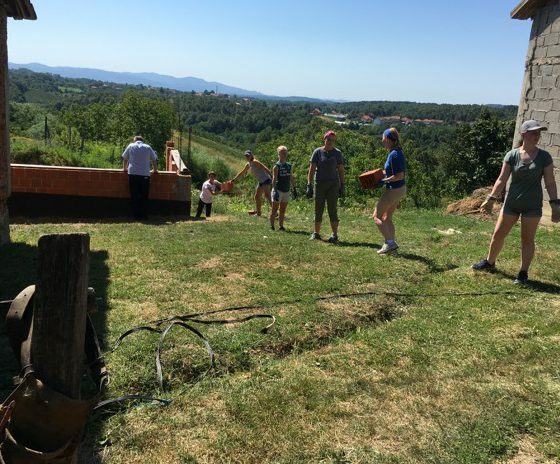 Every morning we drove to the work site in two loads using a car lent to our group by a family for whom a house had been built by a previous team. 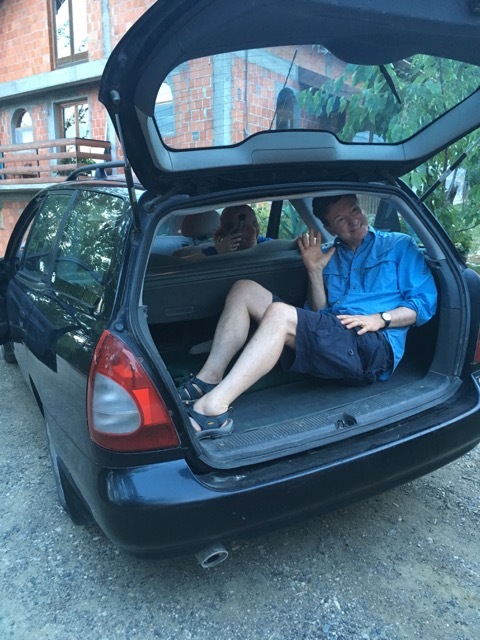 We were a little cosy in the Peugeot station wagon but it got us back and forth on the narrow windy roads. I asked Amy what the family who lent us their car would do for transportation that week. At the house, the work were directed by maestros, some older experienced builders. Initially I’m not sure they trusted the skills of the Americans. Our men-folk were tested by wiring together lengths of rebar. 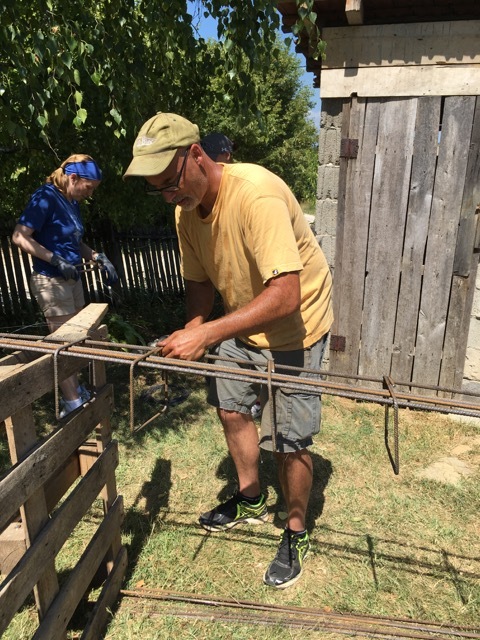 Eventually, we all got to try our hand at rebar-wiring. 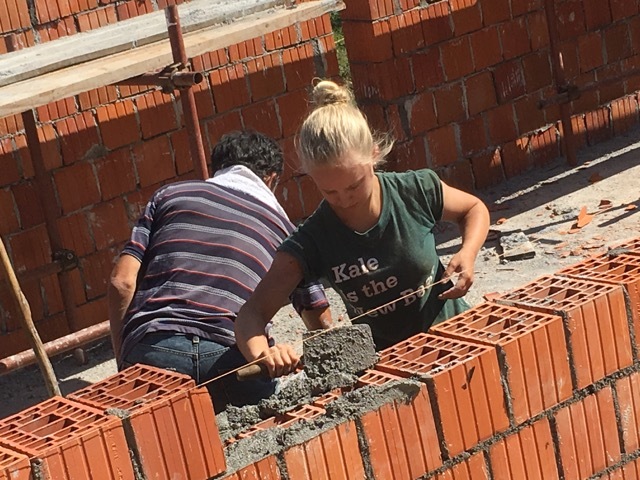 Some got to do a little masonry. 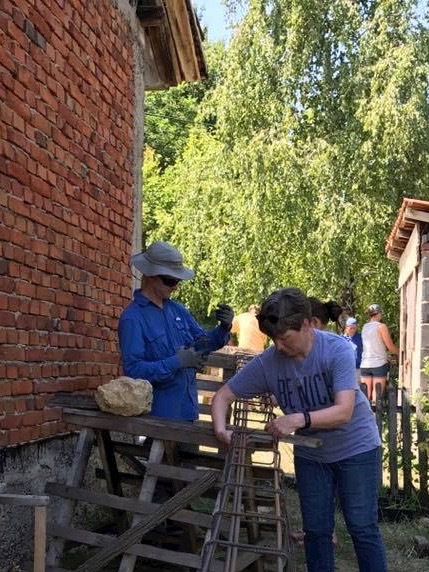 Most of the time, though, while the skilled laborers worked, we waited for tasks we would be allowed to do. We tried to learn some words in Bosnian. And they practiced their English with us. 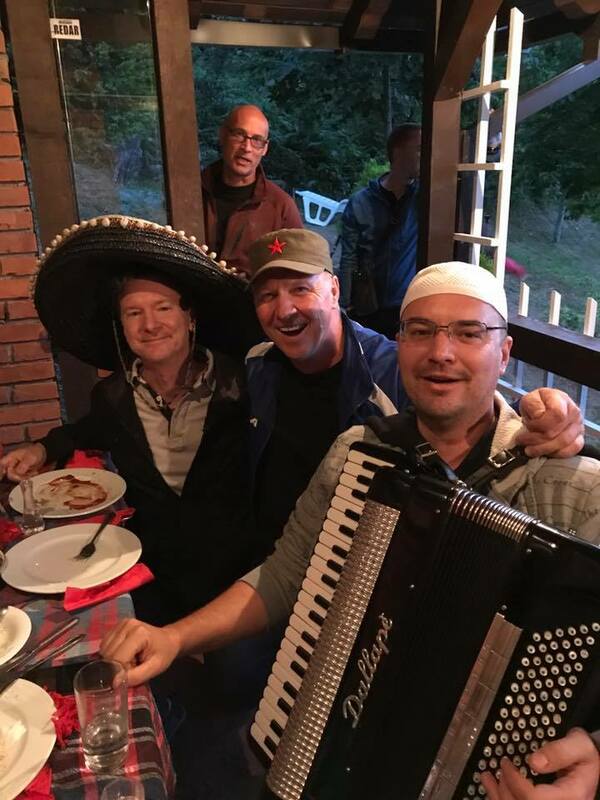 In the evenings we were regaled with music and food. 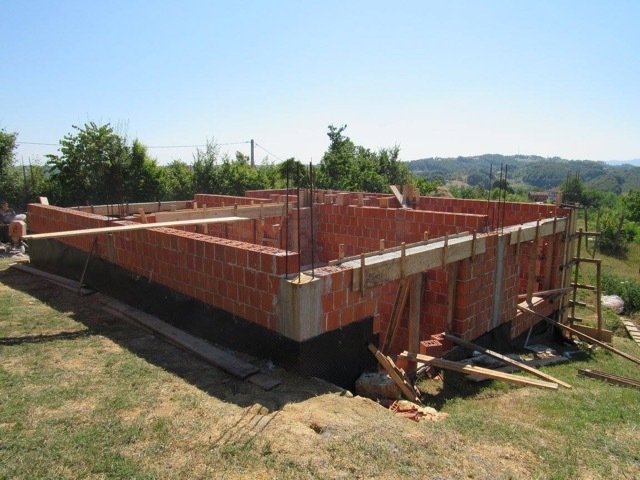 Significant progress was made on the house. But I’m convinced that the real mission work took place in the realm of relationship. On our last day there, we went back to say our good-byes. The families had been so incredibly generous to us. I wanted to give them something in return. 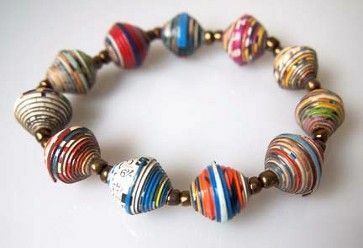 I had brought some bracelets made by women in Haiti. When one of my friends had been raising money for an adoption I bought them from her. These I gave to some of the women. I asked our translator explain that these were made by women from another part of the world who were looking for ways to provide for their families. I told her to tell them that women all over the world can support each other in small ways like this because we understand each other’s struggles. Then I took Tuga and Aleluja from my pocket. How could I possibly explain these little bunnies? I struggled to know how to express what I wanted to say — and, truth be told, I don’t remember exactly what came out of my mouth. I do, however, remember inwardly praying, as the lump rose in my throat, and I looked at the two rabbits sitting in the palm of my hand. “I named these rabbits Tuga and Aleluja,” I said, and I looked at her to see that she recognized the words. “Tuga means sorrow, right?” I asked, and she nodded. Her eyes were filling with tears, as were mine. I looked at Hanka while the translator translated my words. I hoped it was making sense. 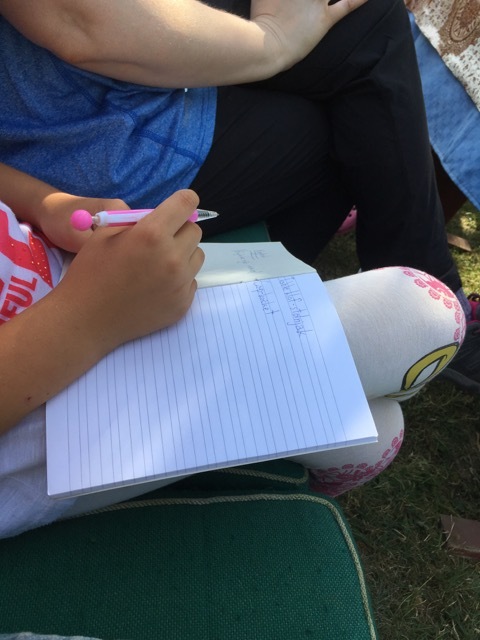 Hanka kept nodding to show that she understood. I paused again, listening to the flow of Bosnian, hoping it was close to the essence of what I was trying to say. 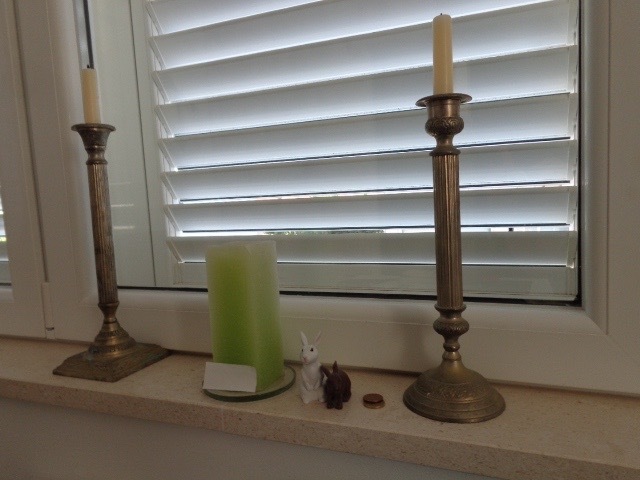 When the translator was done, I handed the rabbits to Hanka. She nodded and hugged me. We were both crying. My friend Leah, who had followed the posts about Tuga during Lent and was also on this trip, saw what was going on. “Is that Tuga?” she asked, and then she offered to take a picture of us. 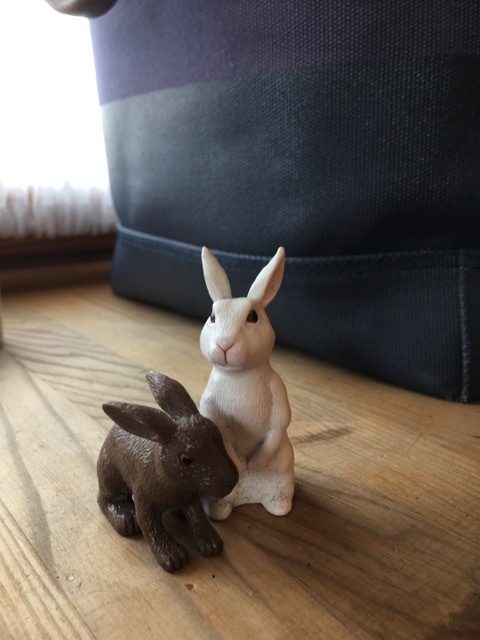 I like to picture Tuga and Aleluja sitting on a window ledge in Bosnia, doing whatever two rabbits can do to remind us of God and of tenderness and of compassion in this world. It was an unplanned ending for my rabbits’ journey, but it seemed a fitting one. Tuga and Aleluja accompanied me to Bosnia this summer. At every place I stayed, I set them on the window ledge or my nightstand to remind me that every single person I would encounter on this trip has known both joys and sorrows..
Before traveling, I tried to read up on Bosnia, which turned out to be learning about Yugoslavia, which led to an attempt to understand the Ottoman Empire. 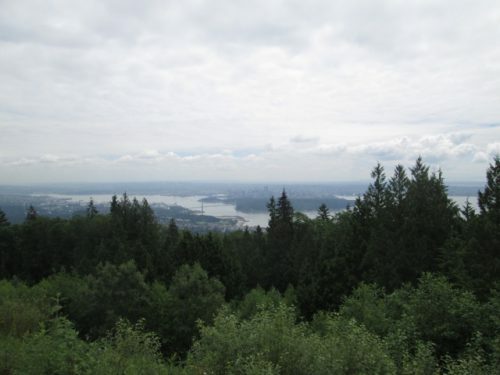 The history of that land is layered and complex. 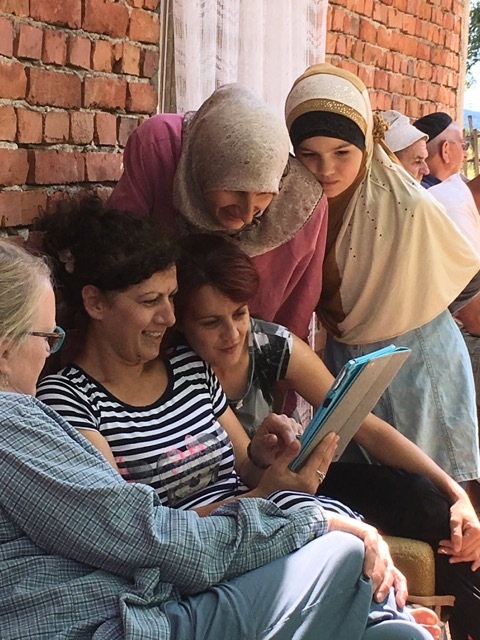 While the United States divides itself along racial lines, Bosnia and Herzegovina is divided along ethnic lines, and religion is often linked to ethnicity: most Bosniaks are Muslim, Serbs are Orthodox Christian, and Croats are Roman Catholic. 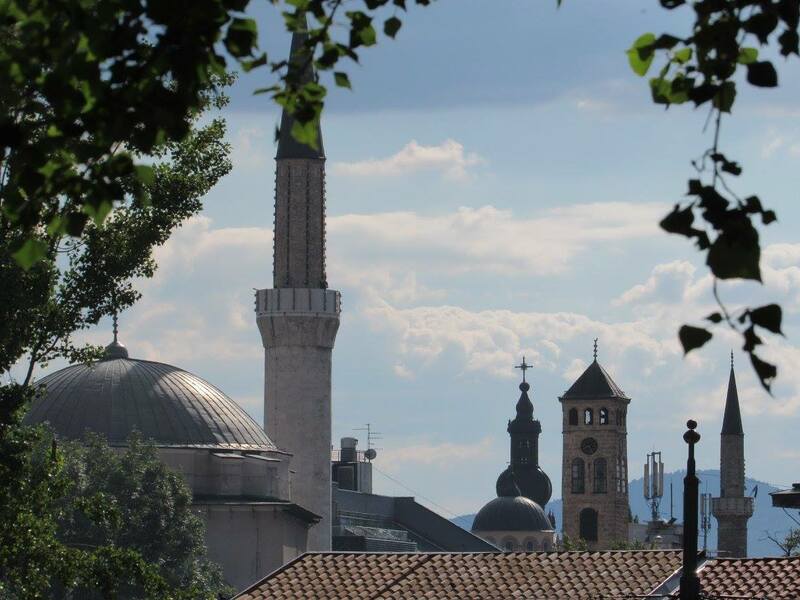 Places of worship in Bosnia, though, have stood side by side for centuries. The wars that resulted in the break-up of Yugoslavia took place along those ethno-religious lines. The BBC documentary, The Death of Yugoslavia, begins its story with a rise in nationalism following the death of Tito. The war in Bosnia was particularly horrible. 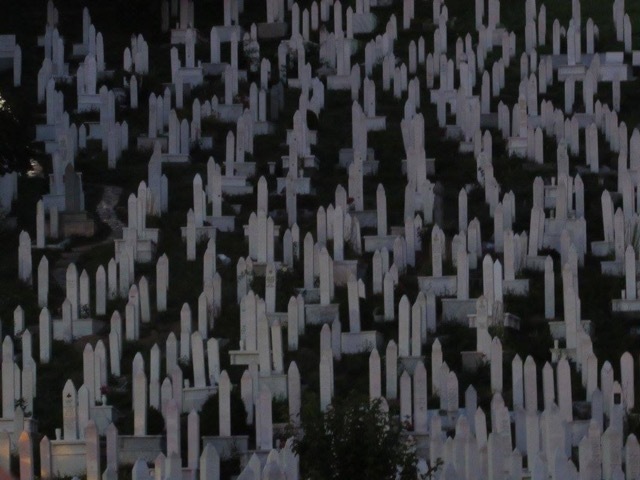 Serbs slaughtered Bosniak men and boys, throwing their bodies into mass graves. The Bosniak women were systematically raped. Although it has been 25 years since their war, the scars are not fully healed. Fragments of bone are still being analyzed and those murdered are still being identified. In fact, we were in Bosnia for “Remembrance Day” — a day set aside to remember, to mourn, and to lay to rest those remains that have been found and identified in the previous year. 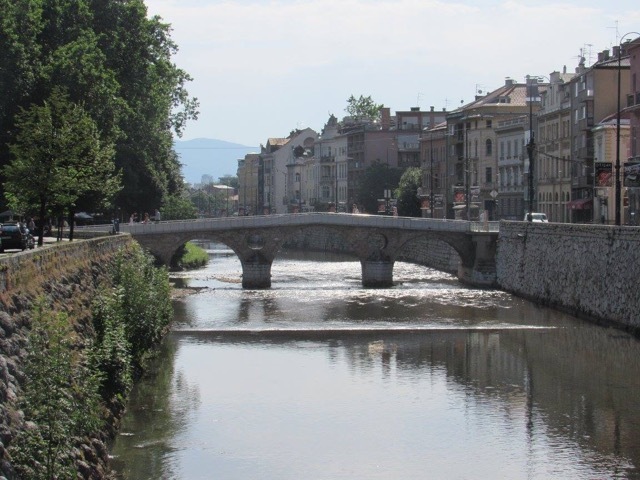 As we toured Sarajevo, we saw the site of the assassination of Archduke Franz Ferdinand of Austria, the event that triggered World War 1. 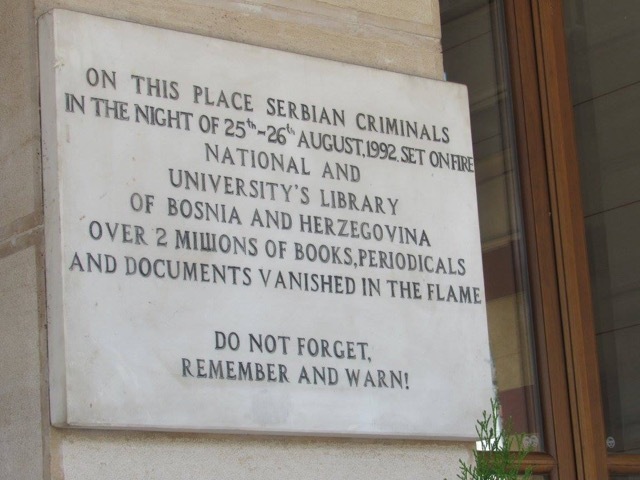 We stood outside the library and I felt sick in my heart as I tried to understand what part of a war involved burning all the books and historic documents that had been housed there. 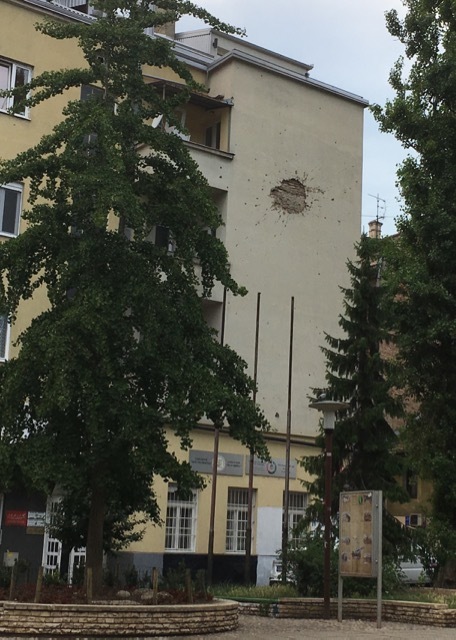 We saw buildings still pock-marked by mortar shells. 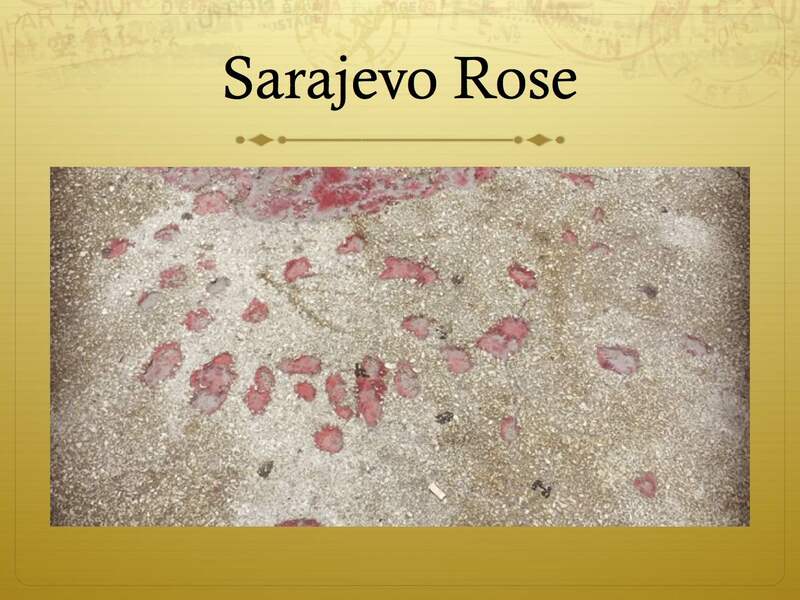 Sarajevo Roses dotted the streets. These commemorated places of fatal mortar strikes — red resin filling the scars left and plaques on nearby buildings with the names of those who died. Parks became cemeteries because they had no other place to bury the bodies. Just months before I had visited several cemeteries in Normandy. Any cemetery is a sobering place to visit, but these war cemeteries were especially heart-wrenching. The cemetery in Sarajevo stood out because these brave young men were my peers. 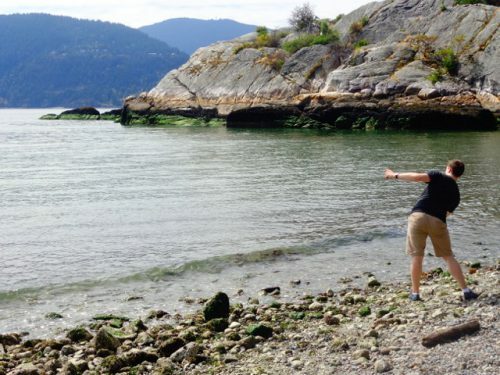 From the start, Amy, the pastor organizing the trip, had said this was a non-proselytizing trip. In the context of Bosnia’s history, it made sense that this trip would not involve talk of religion. We were to be the hands and feet of Christ, ministering to the people of a wounded country. Our actions were our words. I had an advantage over the others on the trip. I had a little bunny to remind me of the sorrow. I have a word problem. I really, really like words. A lot. It should come as a surprise to nobody that on my trip to the Balkans I took pictures of words to look up later. Nor should it come as a surprise that I can spend hours playing with Google Translate. Forget squirrels or shiny things — these are the rabbit trails I follow for amusement. 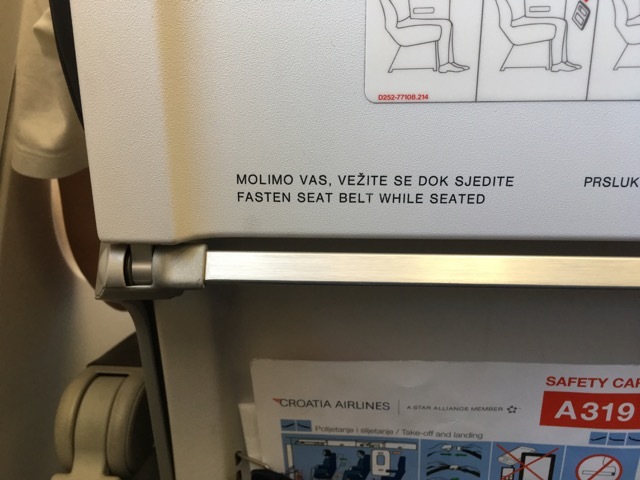 For instance, this photograph was taken of the tray back on my Croatian Air flight. I recognized molimo vas from the language app I used before the trip. It means please. However, I wanted to figure out the rest of the words even though the translation was right below it. Vežite se dok sjedite means Sit while you are sitting. (Google Translate: Croatian to English) But vežite, by itself, get translated tie. Perhaps the literal translation is something about tying yourself in your seat? 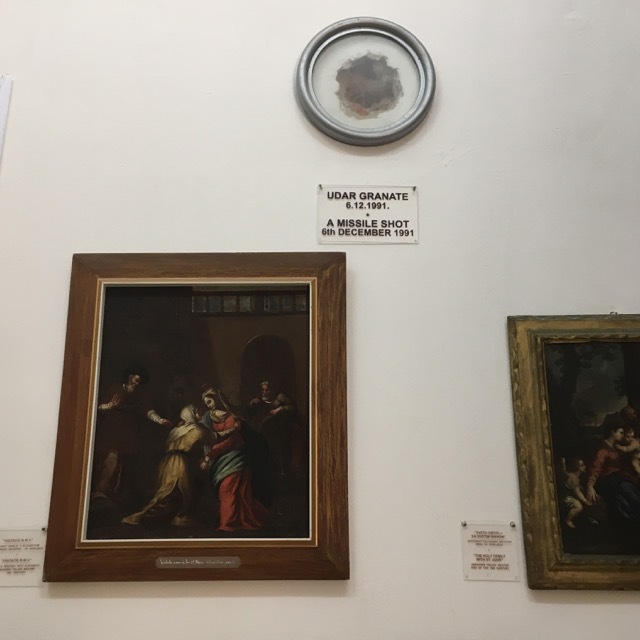 The one time I was brave enough to use Croatian was in the Franciscan monastery in the Old City Dubrovnik. “Dvije,” I said to the man at the ticket table, indicating that I wanted two tickets. “For that you get in free,” he said, in perfect English. He was delighted that I attempted Croatian. 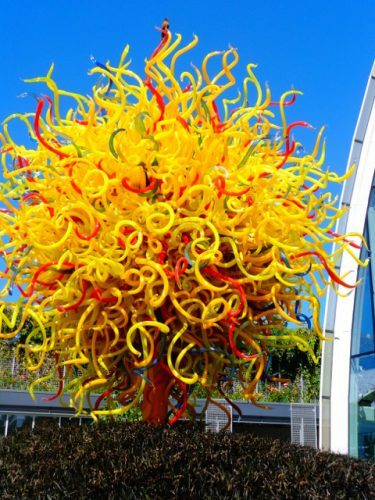 Inside, we visited a beautiful garden and an art gallery. A war scar was framed on the wall. Udar granate means A missile shot according to the sign below. Google Translate (GT) says it means grenade attack. Close, I guess, but different. This one is a mystery. 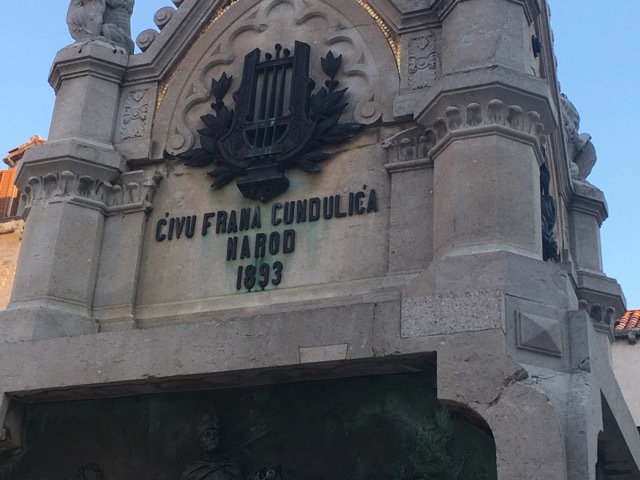 GT translates ĆIVU FRANA CUNDULIĆA NAROD means THE LIVING OF FRANCA CUNDULIĆA NAROD so maybe it’s a person’s name. But if I drop the capitalization, the same words mean a living shroud of crowds of people. If I drop the “narod” because it’s on a separate line, and just look at the first line in all small letters, it means (according to GT) some cranium brake or the black break crank. 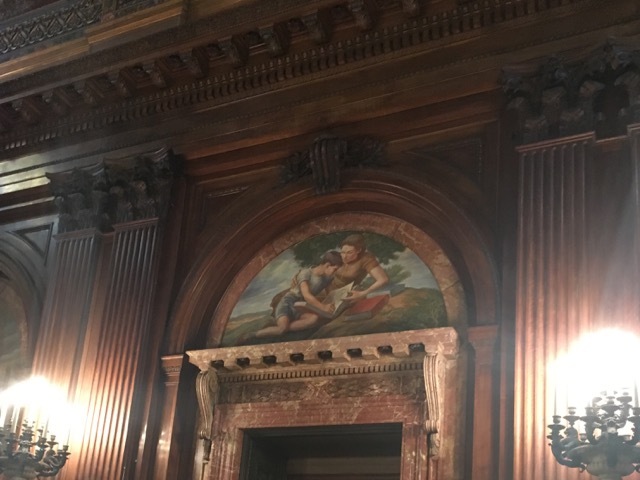 I kind of thought our guide said it was a music hall, but who knows? I used the public restroom at The Tunnel of Hope Museum outside Sarajevo. There I encountered my first squatty potty. It caught me by surprise, especially when my phone fell out of my pocket. Ew. Thank goodness it didn’t fall in. I took a picture of the toilet itself to show my children, and then this one of the sign on the tank to see how it translated out. 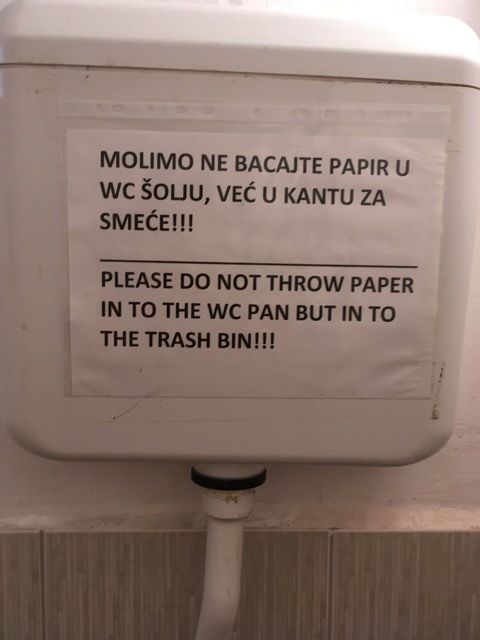 Molimo ne bacajte papir u wc šolju, već u kantu za smeće translates to Please do not throw paper in the toilet, already in a garbage can (GT: Bosnian to English) Not bad, really. I have no idea what the guy thought when I snapped this picture. This was after the soccer game (fudbalski) — and it looked like one of those “I’m with Stupid” shirts. GT defaulted to German for Er heiratet, translating them he marries. We were in Bosnia at the time, so I tried to force a Bosnian translation — but GT said it meant Er hieratet. The other team was from Croatia, so I checked the Croatian translation, and GT said, That’s a heir. I thought GT would know that it should be an, not a. But I’ll forgive GT because the words were, after all, German. 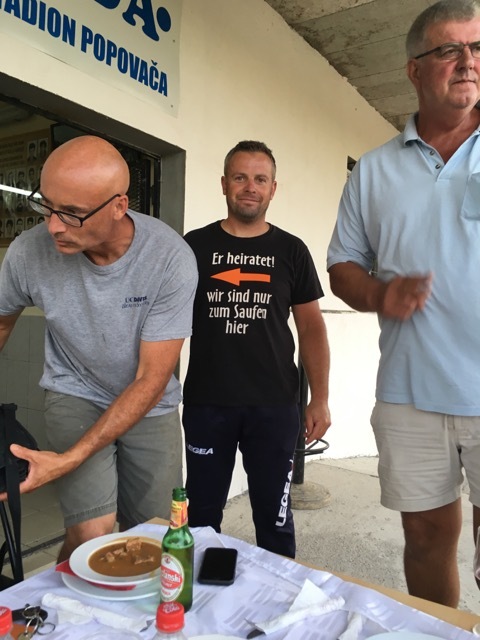 GT couldn’t translate Wir sind nur sum saufen hier from Bosnian or Croatian. In German, however, the words meant we’re just drinking here. A groomsmen shirt. Wedding humor. When words are playthings, and Google Translate is available, fun is all around. I found that on my trip. Ayla’s English was impeccable. Well, nearly impeccable. When we first met, someone asked her how old she was. “Twenty,” she said, without batting an eye. I turned to Amina, our official translator. “Are twelve and twenty similar in Bosnian?” I asked. It would make sense, because they’re pretty similar in English. It reminded me of words that I hesitated to use in Croatia. 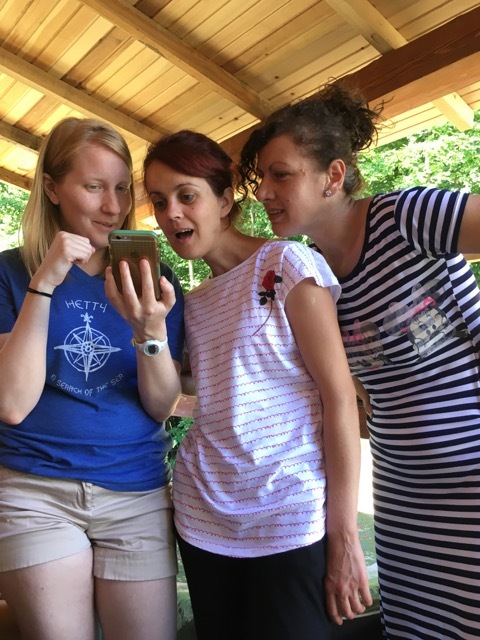 I had learned over 350 Croatian words using an app before I traveled. Some words, however, I consistently confused. 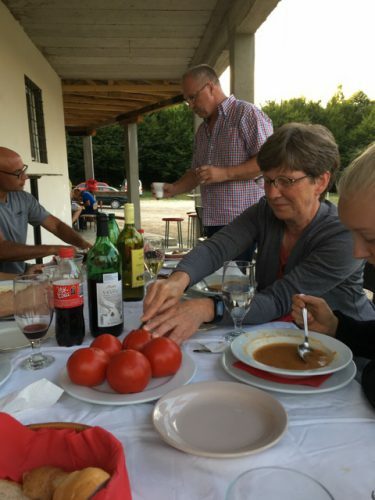 They made a most delicious soup called čorba. The secret ingredient, I learned, was okra. Not fried okra like one would find in the south, but okra that had been cut into little pieces and dried and strung. I’d like to make it here, but I’m not where to find the okra. Back to Ayla — as I said, her English was excellent. 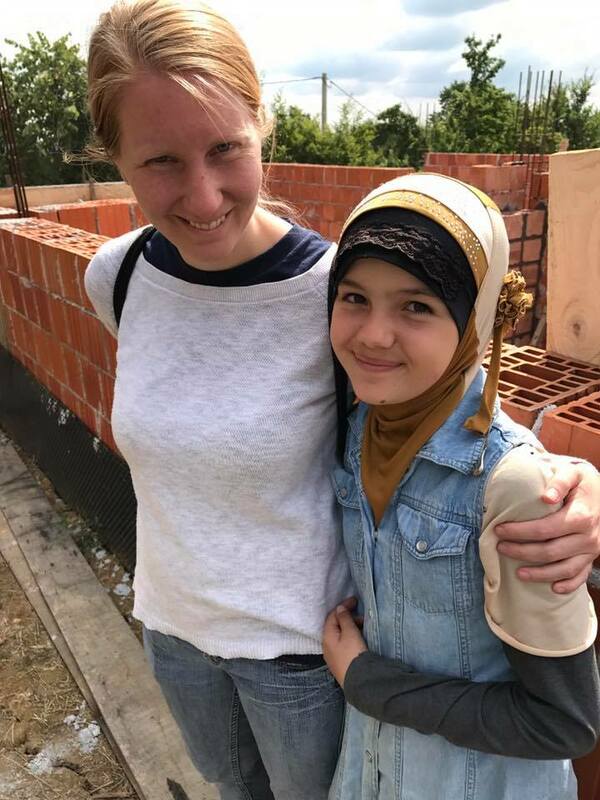 When Amina wasn’t available, I would ask Ajla for help communicating and she was fantastic. 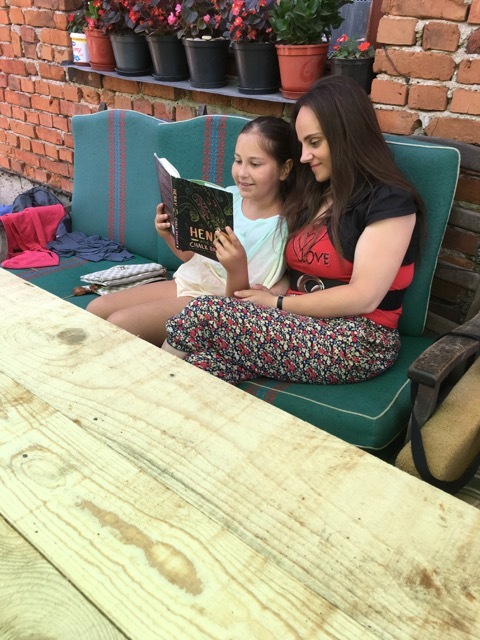 I had brought along a friend’s book to read, a children’s book called Henry and the Chalk Dragon, and finished it on my flight to Dubrovnik. 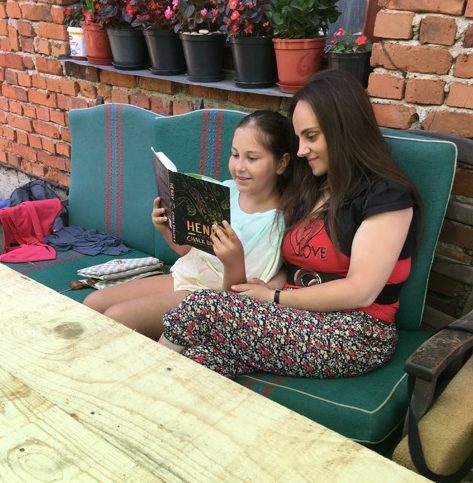 I quickly realized that Ajla had the language skills to read the book — if she was interested. She was. How could we explain the difference between imagination and lies? Henry and the Chalk Dragon is a very imaginative book, with chalk creatures coming to life — but it’s also full of truths. I hope Ajla can see them. 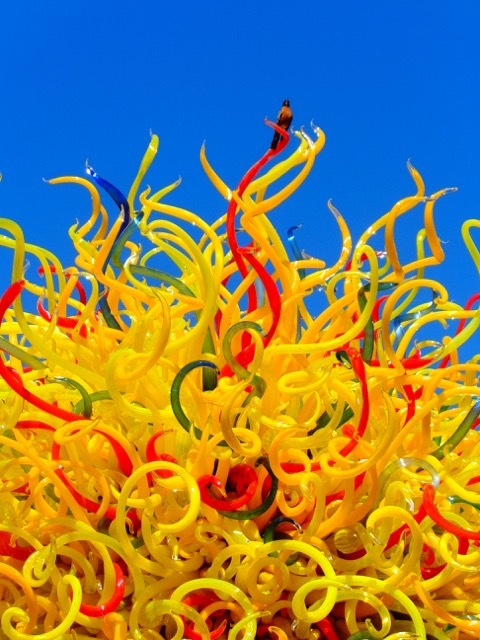 You have to be brave to be an artist…. It takes a fearless knight to imagine something and then let it out into the world.